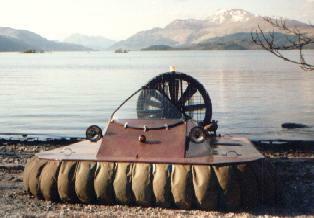 The Eagle 3 is a "do it yourself" 3 seater hovercraft. The driver sits at the front on a centre console seat with handle bar steering and lever throttle. The two passengers sit side by side on a bench seat in the back, the bench seat also acts as a storage compartment. The Eagle 3 was designed by Ken Rigley for cruising and leisure activities. The Eagle 3 is an integrated type hovercraft powered by a Rotax 503 (50 bhp) engine driving a 900 mm 5Z Multi-wing fan via a toothed belt. The hull is a simple plywood construction with soft wood battens in the corners. The Citroen 1.4GT engine can be fitted as an alternative to the Rotax 503. The hull needs to be stretched by 600mm and made 150mm wider to cope with the added weight.